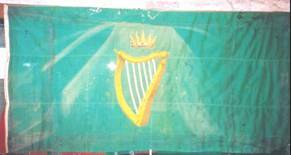 Flag of the 16th (Irish) Division - The "Forbidden Flag"
The Society of United Irishmen, a republican movement which emerged in the 1790s, used a gold harp on a green field (the 'Green Flag'). This flag was carried in the rebellions of 1798 and 1803 and it quickly achieved popular acceptance as the national flag. The flag was used during the widespread peaceful agitations for 'Repeal' of the act of union in the 1830s and 1840s but was viewed as a seditious emblem by the British authorities. In 1848 the Repeal movement split and the radical wing (known as 'Young Ireland') adopted both republican ideas and a tricolour inspired by that of the second French republic. The Young Ireland rebellion of 1848 was quite a small affair and the tricolour flag was largely forgotten until the twentieth century. The next revolutionary movement, the Irish Republican Brotherhood (or 'Fenians') of the 1860s, was much more formidable and it reverted to using the Green Flag. That flag was also used by all the nationalist politicians who campaigned for 'Home Rule' (devolved government within the United Kingdom). By about 1880 or so the Green Flag had become officially tolerated to the extent that one was no longer likely to be arrested for displaying it, but it never had any official status and was always seen as a nationalist emblem. The Green Flag was extensively used during the campaign for repeal of the Act of Union which Daniel O'Connell led during the 1830s and 1840s - the flag is invariably shown in illustrations of the mass meetings convened by O'Connell during that period and it is probable that it was in continuous use from 1798 onwards. Both the Green Flag and the tricolour were used by the insurgents in 1916, but in the period after the rebellion the republican separatists in Sinn Féin tended to use the tricolour while their rivals in the Irish Parliamentary Party (which advocated 'Home Rule' for Ireland within the United Kingdom) used the Green Flag exclusively. The alternative national flags thus became the flags of competing political parties until the general election of December 1918 when Sinn Féin's landslide victory finally relegated the Green Flag to a secondary role. "In 1906 when Peter O'Connor won the long jump championship at the Olympic Games in Athens, he successfully objected to the raising of the union flag ... in honour of his victory and succeeded in having a green poplin harp flag, which had been provided by his thoughtful supporters, hoisted instead." This refers to the national flag in popular use at the time, the well-known Green Flag. Why and who the woman is on the harp? Although there is some suggestion that the harp as an Irish device was in use before 1534, it is only from that date that it appears on the coinage of King Henry VIII. The earliest reported green harp flag was that of Owen Roe O'Niell from 1642. The green, however, apparently only became generally accepted as the Irish colour during the Rebellion of 1798. Henry VIII's harp had a plain fore pillar. By the seventeenth century the top of the fore pillar where it joins at the neck of the harp, shows a grotesque head of a mythological beast known in Irish history as the 'onchu'. By the second quarter of the seventeenth century this had turned into a female head, sometime looking at the observer and sometimes in profile. By the 18th and 19th centuries the female figure had acquired a pair of wings, one of which forms the neck of the harp and had become know as the Maid of Erin and incorporated as such in the British arms representing Ireland. I just finished reading "The Green Flag: A History of Irish Nationalism" by Robert Kee--a very good book which, you will not be surprised to learn, contains numerous flag references. One such reference is to the flag carried by MacBride's Irish Brigade during the Boer War. John MacBride, a friend of Arthur Griffith's, organized this unit with Irishmen (most of American origin) living in the Transvaal who were willing to fight with the Boers. The commander was a Colonel Blake, a former US Army officer. When Blake was wounded in action, MacBride took command himself. Opinion in Ireland (and among liberals in Britain) was strongly pro-Boer, and a Transvaal Committee, co-chaired by Griffith, was formed in Dublin to support MacBride's efforts. One of its first acts was to purchase and send out a flag for the Irish Brigade. It was green with gold fringe and bore a gold harp in the center, plus the inscriptions "Our Land -- Our People -- Our Language." MacBride's Irish Brigade probably numbered no more than 500 effectives at any given time; it fought in about 20 engagements, with 18 men killed and about 70 wounded. The Brigade was operational from September 1899 to September 1900, at which time it was disbanded and most of the men crossed into Portuguese Mozambique. Were the inscriptions in English or Gaelic? The last part of the slogan would seem rather ironic if it was in English. The description I have from "The Green Flag" doesn't say, but I agree it would be odd if the inscriptions were in English. I think it may a different flag, but there is a similar flag, without the fringe or motto, in the Border Regiment Museum in Carlisle Castle. It was captured by men of the regiment from some Irish volunteers. From memory, it is only a small flag, perhaps three feet long by two feet wide. According to Hayes-McCoy the flag was of green poplin bordered with gilt braid and fringe. 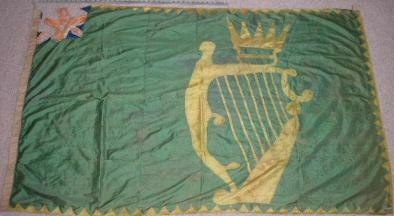 Irish Transvaal Brigade in gilt letters across the top, Ar dTir Ar, Ar Muintear, Ar dTeanga in gilt letters across the bottom, and a gilt harp in the centre of the flag. The green cloth within the outline of the harp was cut away and the triangular hole bridged by six double threads fastened at each end to represent the strings. This is a complicated subject. There were in fact two Irish units ('commandos') which fought for the South African Republic - the second being, in part, formed as a result of differences that arose among the members of the first. A number of different flags were used at various times. The best source of information on the subject is Donal P. McCracken, 'MacBride's Brigade: Irish Commandos in the Anglo-Boer War' (Dublin, 1999). The author is professor of history at the University of Durban and the book is mainly a military history but it contains several passing references to flags - as well as one photograph which shows members of the first Irish commando with an uninscribed Green Flag. I will send a scan of this photograph when time permits. "Every Irishman worthy of the name and every Irish-American in South Africa will be found in the ranks of the Irish Brigade of the S.A.R., under the sacred Green Flag, fighting against the brutal English Tyrant. 'God save Ireland'." "From land to land throughout the world the news is going round, That Ireland's flag triumphant flies on high o'er English ground. In far-off Africa today the English fly dismayed Before the flag of green and gold borne by McBride's brigade." On p. 59, McCracken describes the presentation to the first Irish commando of the flag shown in G.A. Hayes-McCoy, 'A History of Irish Flags from Earliest Times', plate iv. The flag was presented on 23 December 1899, having been sent out from Ireland. It is a Green Flag with the centre of the harp cut away. An inscription over the harp reads 'IRISH TRANSVAAL BRIGADE' and one below the harp reads 'AR dTIR AR MUINTEAR AR dTEANGA' - 'our country, our people, our language' in Irish. "The bullet-pierced flag of the Irish Brigade was hung on the platform, and among those on the platform were men such as Mr Gillingham, who had fought under that flag." It was presented to the Irish state in 1952 and is now in the National Museum of Ireland. Some 1798 insurgent's Green Flags here: http://www.iol.ie/~98com/flags.htm and information on their use and the often hasty manner in which they were produced (the women, we hear, did not limit themselves to flag-making). The ballad "At Boolavogue" mentions the Green Flag. The flag above is held in the Museum of the Border Regiment in Carlisle Castle UK. According to their records (very sketchy unfortunately) it is a regimental trophy that was captured in the South Eastern Free State in April 1900 near the town of Wepener. And that is all they know about it. Inquiries at the National Museum of Ireland also drew a blank. The two Irish Volunteer Brigades with the Boer forces had several green flags with golden harps among them but neither ever served in that part of the country. This is also an unusual design with the crown over the harp - especially as these volunteers were all fierce republicans. The crown itself is also unusual. The only other place I have seen that design of crown before is on the coat of arms of the province of Munster in Ireland, that is, until I saw the flag of British Columbia which has more or less the same design of crown in the middle of the Union Jack. Can anyone who might have seen this design of Irish flag before and can give me a lead as to whom it may have belonged to or where it might have originated? What about the crown? What is the history of this particular design of crown? This is a 'standard' heraldic crown known variously as 'antique', 'eastern' or 'radiated'. It was used on some Irish flags by those in favour of an Irish kingdom that was separate from the British kingdom. Since there was no recognized Irish crown the antique crown made a suitable substitute. It appeared on some flags of Irish Volunteer units formed for the defence of Ireland during the American War of Independence, and in the 1840s on flags of the movement for the Repeal of the Union with Britain. It does seem strange on a Boer War Irish brigade flag. The antique crown on the arms of British Columbia was added by the College of Arms. The original arms, designed by Cannon Arthur Beanlands, contained features that were heraldically unacceptable. The antique crown appears to have been an alternative to the royal crest which was above the shield in Beanlands' design. An antique crown seems to have been adopted as a traditional Irish symbol, because of its use in the arms of Munster. The two Southern Command Brigades of the six Irish Army Brigades, have an antique crown on their Colours, introduced in 1964. Photographs of them are in Irish Flags by G.A.Hayes-McCoy. After many months of research I have established a reasonably clear picture of the provenance of a green flag inherited by members of my family. Above are two pictures. One is a photograph is of a green harp and crown flag, used by Captain Franklin aboard his ship, prior to his death in 1816. The other is of a ship (not his) from the same period flying a similar flag from its main mast. Franklin Tennent was the illegitimate son of a wealthy Belfast ship owner and banker, William Tennent. William Tennent was a founding member of the United Irishmen, along with Drennan and Tone, and was jailed in Fort George, Scotland for his part in organizing the failed rebellion of 1798. Another of William's brothers, also prominent in the United Irishmen, became a battalion commander in Napoleon's army and was killed in action in 1813. The provenance of the flag can be verified by an inscription on the hem of the flag, stating "Flag of my brother Franklin's boat", written by my great great grandmother, Octavia Dawson (nee Tennent). In a recent visit to the Public Records Office of Northern Ireland I discovered letters from Franklin, Octavia and their father relating to Franklin's service in his father's business, and to the dispersal of his effects after his death (he died at the age of 24, unmarried). His identity and activity in the service of his Father's merchant vessels is further confirmed in regular shipping advertisments placed in the main newspaper of the day, The Belfast Newsletter. This paper also contained notice of the death of "Captain Franklin Tennent". According to family anecdote, the flag was made for Franklin by his sisters, when he was asked to act as Commodore of a convoy (presumably during the British-American war of 1812). I have located notices of Tennent & Co's ships sailing in convoy, but not the notice relating to this specific occasion. I have discussed the flag with David Prothero and Vincent Morley, both of whom have made significant contributions regarding the use of similar flags on your webpages. Vincent Morley initially suspected that the flag dated from the mid nineteenth century (this was prior to my verification of the identity and occupation of Franklin). David has questioned whether the Union Jack may have been a later addition to the flag, which is a possibility. 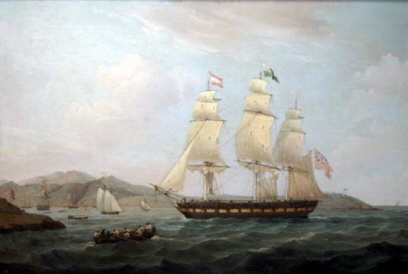 I have also drawn David's attention to an 1814 portrait of the ship Hibernia (whose master, John Lennon, was also an Ulsterman), flying a green flag from its main mast. Copies of Franklin's flag and the portrait of the Hibernia are shown above. Would anyone have any suggestions concerning the significance of the "U" shaped symbol under the crown (e.g., Ulster; United Irishmen)? Znamierowski (2000) shows Irish flags on pages 20 & 19 in two previously published charts. The one depicted on page 20 is green enough but the one one page 19 is surely blue despite being described as a "Groene Ierse Vlag". In discussing foreign infantry regiments in the army of the French Republic, Digby Smith records the presentation, at its creation on 13th August 1803, to the ' Legion Irlandais ' of military colours of green flag bearing a golden harp, to which standard was added an eagle in 1804 ( of the style referred to by him as ' M 1804 ' ). Originally one battalion only, the Legion Irlandais was increased to three in 1809 and the other battalions also received special colours. On the 3rd August 1811 the name was changed to the 3e Regiment Etranger ( a forerunner of the present foreign legion ? ) and after various actions it was disbanded on the 12th May 1814. And now I find that this is contradicted by an article ( http://www.magweb.com/sample/seel/s11ir.htm ) by Jean Lochet on ' The Irish Legion ' ( presented online as a sample from his ' Empires, Eagles and Lions ' magazine ) he says that there were five battalions, gives other dates and doesn't describe any flags although the article has a picture of an antique harp with the words ' L'INDEPENDANCE D'IRLANDE ' below it. Lochet is correct, Smith has it wrong. On 5th June 1804, the Legion Irlandaise were presented with a colour, which was green with, on the obverse, a tricoloured oval in the centre surrounded by an oak wreath; across the oval was the motto LE PREMIER / CONSUL / AUX IRLANDOIS / UNIS (NB the spelling of 'Irlandois' isn't a mistake, merely an archaic spelling). In each angle was a gold harp with silver strings. On the reverse was a red oval bearing the motto LIBERTE / DES / CONSCIENCES / INDEPENDANCE / DE L'IRLANDE in gold. Surrounding the oval was a wreath of oak and laurel, and there was a harp in each corner as on the obverse. The finial was a plain spearhead. This was replaced on 5th December 1804 with a green flag with the motto L'EMPEREUR / DES FRANCAIS / A LA LEGION / IRLANDAISE in gold on the obverse and, on the reverse, the harp and motto device that Lochet uses. The finial was the eagle. The Legion was renamed Regiment Irlandais, of two battalions, in 1805, and increased to five battalions in 1809. In 1813, it was renamed 3e Regiment Etranger. In 1810, the 2nd and 3rd Battalions were presented with their colours - similar to the December 1804 design, but the staff had a plain spearhead finial. The 4th and 5th were also presented with colours; the date when this happened is unknown, but must have occurred before 22nd July 1812, because the 5th lost their colour at the battle of Salamanca (I wonder what happened to it??). By 1812, the original flag was too tatty to be carried and was replaced by an 1812 pattern colour without any added inscriptions. The eagle was deposited in the depot at Bois-le-Duc in September 1813 (and has since disappeared). The tradition of foreigners serving in the French army is a long one, and well predates the Irish Legion. Despite their use of green on flags and uniforms, the modern-day Foreign Legion trace their unit only as far back as 1831. A variation on the usual theme; known flag of uncertain appearance. "Greenish flag with harp and small cross on it." Probably same flag described as "white cross and harp". Also, "Similar flag .... with the crown over the harp." The description does not seem to match any flag on the FOTW website nor any flag in Hayes-McCoy's 'Irish Flags'. Letter of complaint from Mr.Kelly. "Sunday 20 May 1883. Had 27 flags flying. Union Jack at fore topmast stay, No 6 of Marryat's Code under it, very old greenish flag with harp and small cross on it on top at main, the ensign being the worse of the wear and a little torn, it was not hoisted. At 4 pm a Spanish man of war boat came with British consul and ordered all flags hauled down including Union Jack. The old flag mentioned has been flying in different ports in England, Ireland and Scotland and over three parts of the globe it is similar to many I'm sure yourself has seen on Sundays or feast days. Steam yacht 'Gitana', H.Jameson Esq. of Dublin came into this port the following day with a similar flag at her main with the exception she wears the crown over the harp as her club flag." "24 July 1883. Consul at Corunna reported that a Fennian flag (white cross and harp) had been hoisted by Mr.Kelly, Master and owner of Brig 'Trio' registered in Dublin. Green flag was not under Union Jack, which itself was below a line of bunting. Fenian flag most conspicous at main mast. No flag at peak. Steam yacht 'Gitana' owned by H.Jameson Esq. of Dublin did not have similar flag at main, but Royal Irish Club flag. Spanish fly matriculation flag of vessel at mainmast to show what port she belongs to. Fenian flag considered to be a national flag." "24 July 1883. Consul at Corunna reported that a Fennian flag (white cross and harp) had been hoisted by Mr.Kelly, Master and owner of Brig 'Trio' registered in Dublin. Green flag was not under Union Jack ..." - Would that mean that it had been OK if it had had been flown below the UJ? The offence was to hoist the Union Jack on a merchant ship. The Board of Trade took a relaxed view of the matter. In a minute it was pointed out that fancy flags, or even rebel flags, were not prohibited if they did not resemble colours of Her Majesty's ships or national colours, and that since the flag had not been flown at the peak, it had not been worn to show nationality. It was recommended that instructions to consuls on the matter, which referred to 'improper colours' should be altered to 'illegal colours'. The flag of the 16th (Irish) Division is depicted above. The accompanying account at http://freespace.virgin.net/sh.k/disflag.html is one of the saddest stories of the War of 1914-18, summarized "The tragic story of the 16th Irish Division, which ended with its expungment from Irish history, could not have had a worst start when the British military establishment refused to recognise, in even the smallest detail, Irish willingness to provide an autonomous formation as the reborn nation's contribution to the 'Great Fight for Civilisation'. Lloyd-George, who was the British Prime Minister for the latter part of the war, included the ... damning indictment of Kitchener in his War memoirs".